These superior offices enjoy a prominent business address in the centre of Dammam, home to Saudi Arabia’s oil and gas industry. 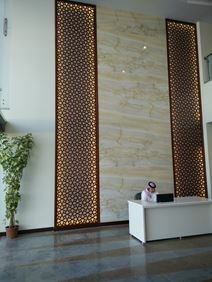 The office has a charming architecture and offers an excellent view of the Arabian Gulf. Surrounded by many commercial centres, international corporations and multi-national companies. It is the place of the elite companies such as NCB Bank, Hercules Offshore, Samsung Contracting, EMC2 etc. The nearby King Fahad Causeway links Saudi Arabia to Bahrain. This remarkable workspace is located in a prime business and residential area, and occupies the second floor of the building and is fitted out with a simplistic, modern interior. There is a great on-site management team with a fully functioning kitchen area and a business lounge, great for conferencing facilities. The surrounding area is full of major petrochemical companies, creating a fantastic area for an enterprise. Easily accessible from Dhahran, Khobar and Dammam and a short distance to the Aramco Company gates this modern business centre is currently home to a number of well-known companies that include Bonatti Group, Mena Business Services, Nestle Saudi Arabia and Tamimi Group. You can have access to this site 24/7, allowing you to work through late hours, however long you desire. The space is also located close to a range of amenities, providing everything you could need within walking distance. Situated in the commercial district of Al Khobar on the 21st floor of this tower building, these high-end fully equipped serviced offices provide stunning views of the skyline and the Arabian Gulf below. The Tower is designed to satisfy every possible need that a business might have. This location offers high-end and fully equipped serviced offices, premium boardrooms (20 person) executive meeting rooms (4 person), and business lounge in one of the best addresses in Al Khobar Dammam Area. Flexible leasing terms (starting from 1 month) is a great way to help companies avoid long time commitments.